Summer is sadly still a few months away, but with a hint of warm weather last week in New York (I think it might actually have reached 60 degrees one day! ), it really got me longing for warm, sunny days. Not just the beach and barbecues, but the real stars of summer: things like ice cream, s’mores, margarita popsicles, and Ralph’s Famous Italian Ices (the creme ones, duh). 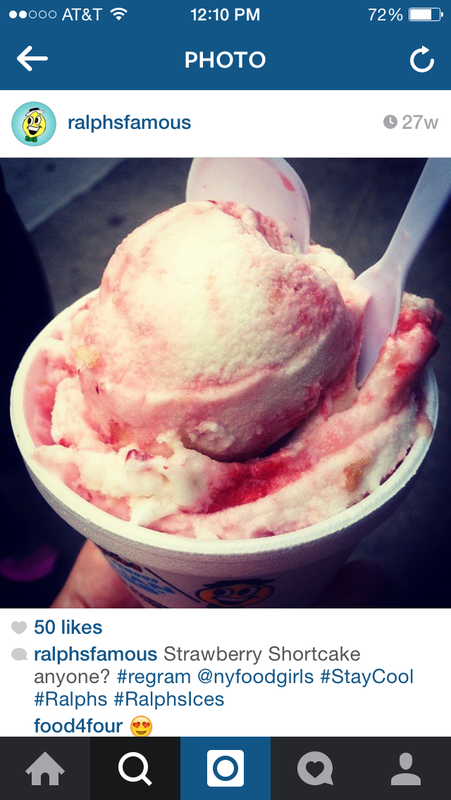 For those not blessed with Ralph’s in their lives, it’s an Italian ices and ice cream establishment with locations all over New York City, Long Island, and New Jersey, open seasonally. To me, Ralph’s is synonymous with summer, the beach, warm summer nights, and basically, my childhood. My all-time FAVORITE flavor of Ralph’s is Strawberry Shortcake (not to be confused with Strawberry Cheesecake!). It’s refreshing and sweet and so perfectly embodies summer, AND it has graham cracker pieces mixed in. Due to my love affair with graham crackers (see: s’mores cake with graham cracker frosting) Strawberry Shortcake has been able to clinch the title as my favorite Ralph’s flavor, beating out tough competition like Mint Chip, Mudslide, and Chocolate Peanut Butter Cup. So, last Wednesday as I was sitting at my desk dreaming of Ralph’s Strawberry Shortcake, it hit me. 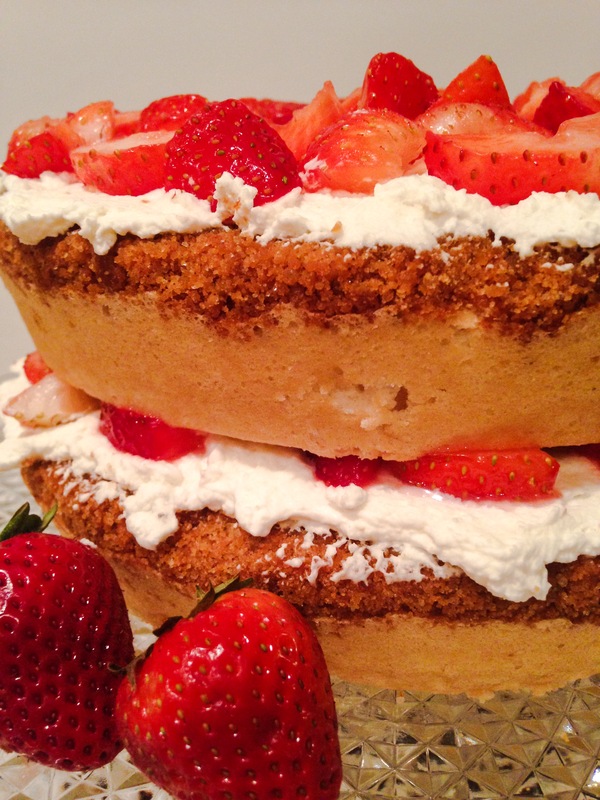 Why not bake a Ralph’s-inspired strawberry shortcake, with graham cracker somehow mixed in? It’s such a match made in heaven that I’m almost surprised it hasn’t been done before. For three torturous days I practically counted down the minutes until I had time on Saturday to bake this dream cake. What I came up with is genius, if I do say so myself. 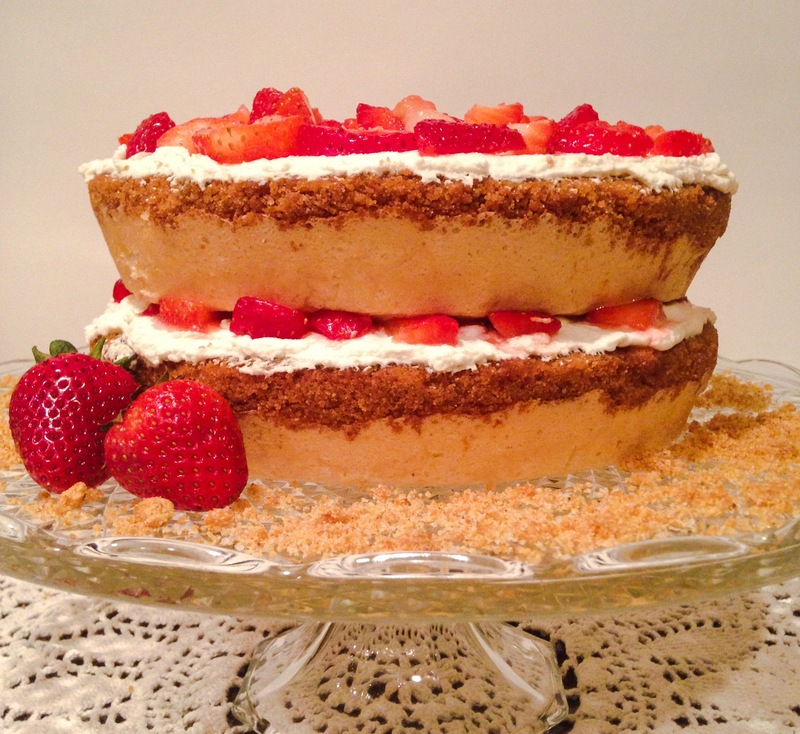 Layers of delicious white cake with graham cracker pie crust, stacked and topped with homemade whipped cream and freshly diced strawberries. I used this strawberry shortcake recipe as a starting point, improvised for the pie crust, and hoped for the best. It came out so perfectly on the first try that I would hardly change a thing, and I’m now longing for summer even more so that I have more opportunities to bake this cake. The cake itself is similar to angel food cake but more dense, which I think actually works better with the graham cracker crust since I had been concerned that a light and airy angel food would not hold up when paired with the graham cracker and toppings. 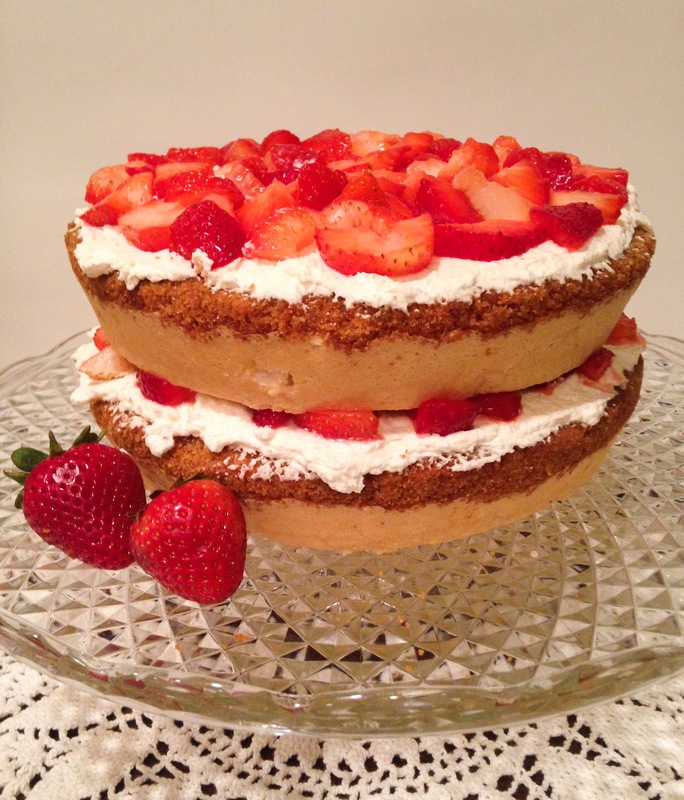 Just like in Ralph’s Strawberry Shortcake, the graham cracker MAKES this cake. If you like strawberry shortcake, cake, strawberries, graham crackers, whipped cream, dessert, puppies, rainbows, happiness, or good things, you should probably make this cake. Seriously though, do it. 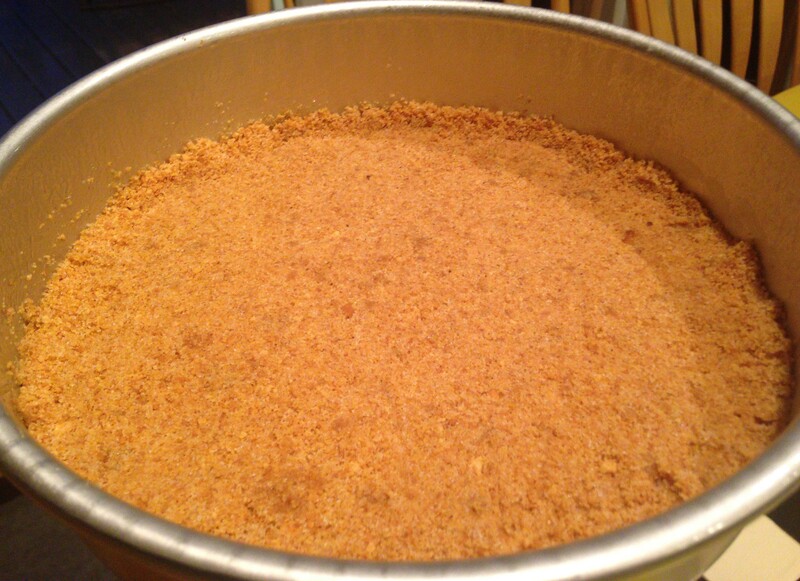 Begin by making the graham cracker pie crust. Combine graham cracker crumbs (crush them yourself or buy them in crumb form), butter, sugar, and cinnamon. Cut a circle of parchment paper to fit the bottom of each cake pan and lightly grease the pans, under and on top of the parchment paper. Then press half of the graham cracker mixture into each pan. You can use the bottom of a glass or other flat object to make sure the graham cracker crumbs are well pressed. Bake on 325 for 7 minutes, and then allow to cool. Next, make the cake batter. In a large bowl, sift together flour, cornstarch, sugar, and salt. If you’re questioning whether your bowl would be considered medium or large, it’s probably not large enough (you will need the space when you combine the two mixtures later). Then carefully pour in a cup of boiling water. I measured water post-boiling in a glass measuring pitcher in order to make sure I had a full cup of water and to avoid burning myself or melting a plastic measuring cup. Stir in the boiling water and allow to cool (it will be very thick). This next step is kind of tricky if you’ve never whipped egg whites before, which I never had until a few weeks ago! Since that hardly makes me an expert, I recommend watching some Youtube videos or doing some Googling before you start. It’s actually really not complicated, the trick is just knowing when to stop whipping. Once you’ve done your reading, whip together egg whites, baking powder, cream of tartar, and vanilla until stiff peaks form. Then fold the whipped egg whites into the cooled batter until they’re well combined. Fold the batter by turning it over and over with a spatula, bringing batter from the bottom and sides up and over into the middle. This step will take a little while, and just when you think the batter is fully combined, you’ll probably find just a little bit more that’s still separated and you’ll have to keep folding. 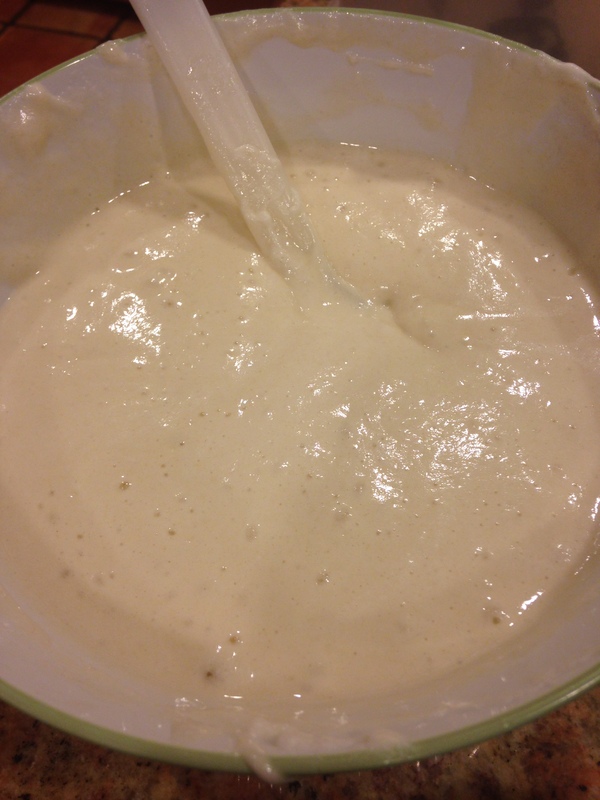 The fully combined batter is unlike any cake batter I’ve ever made before; it’s light, airy, and even a little foamy! Pretty exciting stuff =D. Pour half of the batter into each cake pan on top of the pie crust (yes, the pie crust gets double-baked). Bake on 350 for 30-35 minutes or until a toothpick inserted in the center comes out clean, and the tops have a nice golden color. Allow cakes to cool completely before removing from pan. While cakes are in the oven, wash, dry, and dice the strawberries and then place your metal mixing bowl and wire beaters in the freezer to chill for 10-15 minutes. Once chilled, whip together heavy whipping cream, powdered sugar, and vanilla until you have a nice stiff whipped cream. It’s amazing to watch it change from liquid to whipped cream in a matter of seconds, similar to the whipped egg whites! Once cakes are cooled, assemble the cake. Turn the first layer over onto a cake plate so that the pie crust side is on top. Cover the crust with half of the whipped cream and top with half of the diced strawberries. Place the second layer on top and finish off with the remaining whipped cream and strawberries. If possible, make, or at least assemble, the cake the same day you plan to serve it. The strawberries tend to leak pink juice onto the whipped cream so the cake looks best immediately after it’s assembled. Keep the cake refrigerated to prevent the strawberry juices from leaking and to preserve the strawberries and whipped cream. P.S. It would pretty much be a crime against humanity if I didn’t employ this graham cracker crust method to make a s’mores cake, so that will definitely be happening. Make the graham cracker pie crust: Preheat the oven to 325. 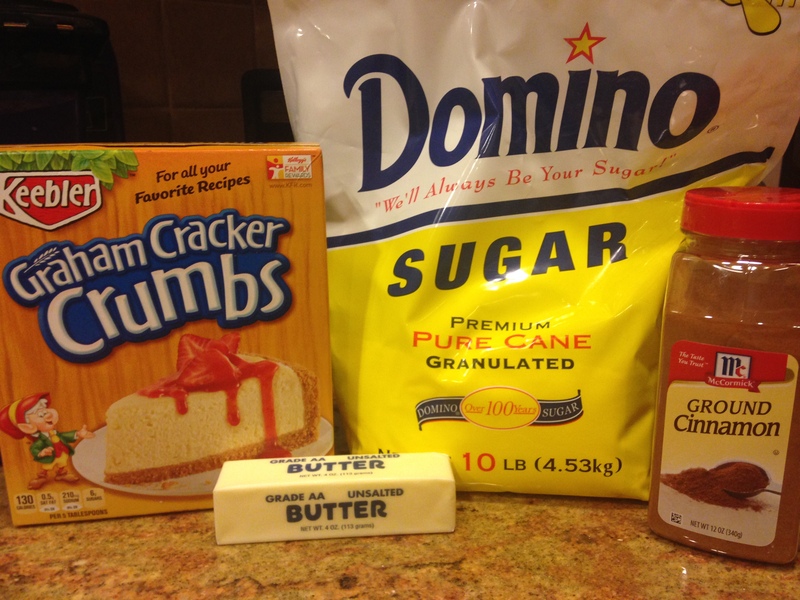 Mix together graham cracker crumbs, butter, sugar, and cinnamon. Cut circles of parchment paper to fit the bottoms of two 9″ cake pans and lightly grease the pans, under and on top of the parchment paper, and the sides. Then press half of the graham cracker mixture evenly into the bottom of each pan. You can use the bottom of a glass or other flat object to make sure the graham cracker crumbs are well pressed. Bake for 7 minutes, and then allow to cool. Make the cake: Preheat the oven to 350 and boil a small pot of water. 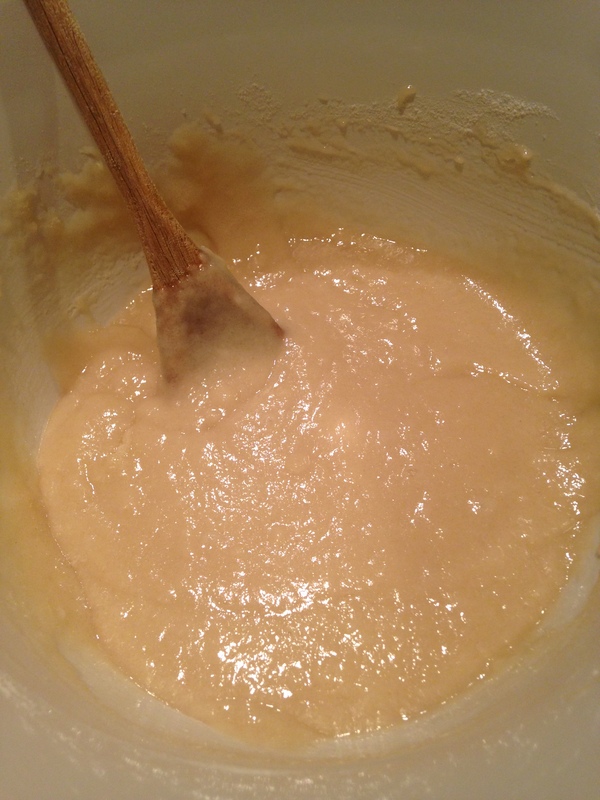 In a large bowl, sift together flour, cornstarch, sugar, and salt. Once sifted, stir in 1 cup of boiling water until fully combined and then allow to cool. In the bowl of a stand mixer, whip together egg whites, baking powder, cream of tartar, and vanilla until stiff peaks form. 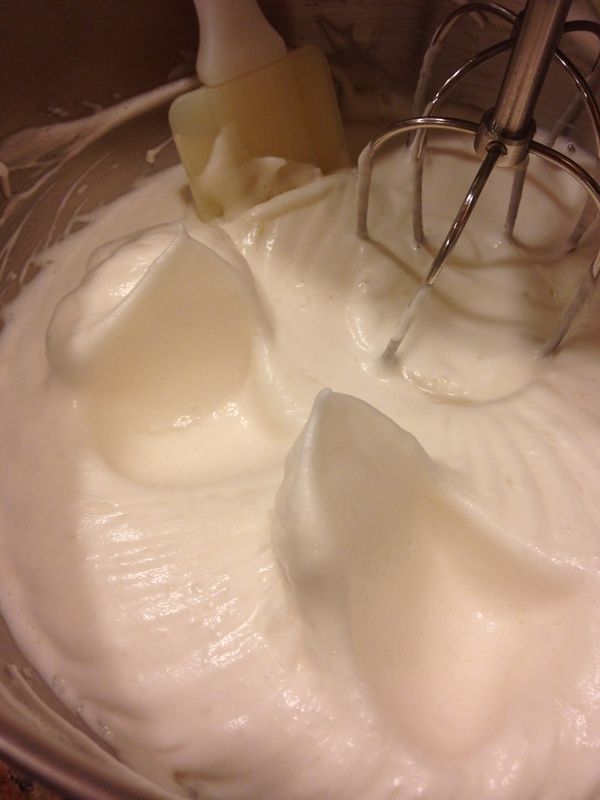 Then fold the whipped egg whites into the cooled batter until fully combined. Pour the batter into the cake pans (over the baked pie crust), and bake for 30-35 minutes or until tops are golden and a toothpick inserted in the center comes out clean. Allow cakes to cool in the pans. 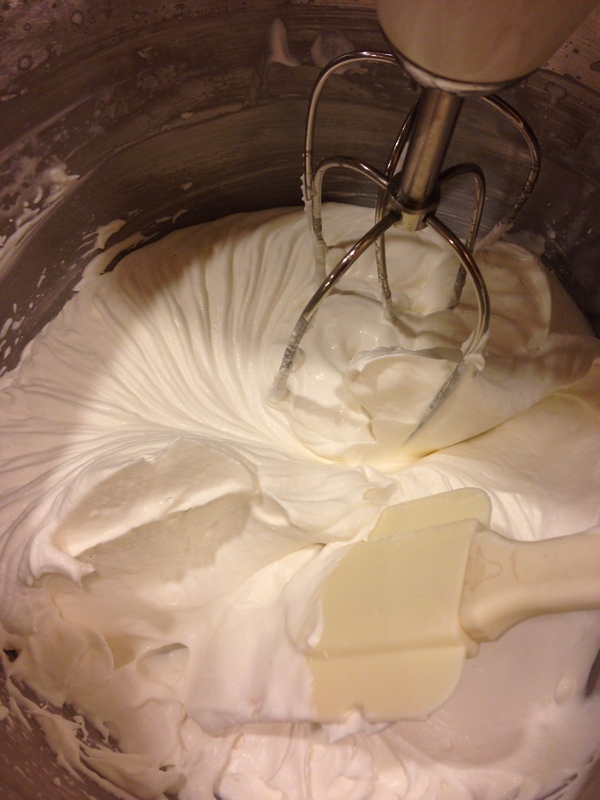 Make the whipped cream: Place your metal mixing bowl and wire beaters in the freezer for 10-15 minutes. Once the bowl and beaters have chilled, combine heavy whipping cream, powdered sugar, and vanilla and whip until a stiff whipped cream has formed. 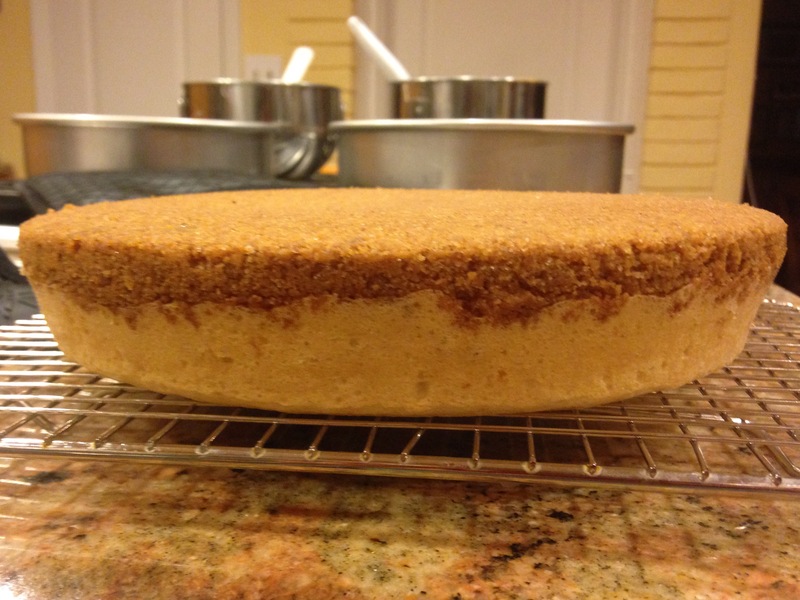 Assemble the cake: Place one layer of cake on cake plate, pie crust side facing up. Top with half of the whipped cream and half of the diced strawberries. Place second layer on top, also with pie crust facing up, and top with remaining whipped cream and diced strawberries. *If possible, make, or at least assemble, the cake the same day you plan to serve it. Pink strawberry juice will likely run onto the whipped cream so the cake looks best immediately after it’s assembled. Keep the cake refrigerated when it’s not being eaten. Fabulous post! Beautiful and delicious is a great combination.